Wasps head coach Mel Mansfield huddles with her side. WASPS Netball’s biggest challenge of the Vitality Superleague so far sees them go head-to-head with Saracens Mavericks on Monday – the first time the respective names have met on a netball court, away from their associated rugby sides. The unbeaten Wasps face third placed Saracens – who have only tasted defeat once this season to undefeated the Manchester Thunder, but the visitors are in for a tough test against the champions, appearing at their Ricoh Arena home for the first time this campaign. 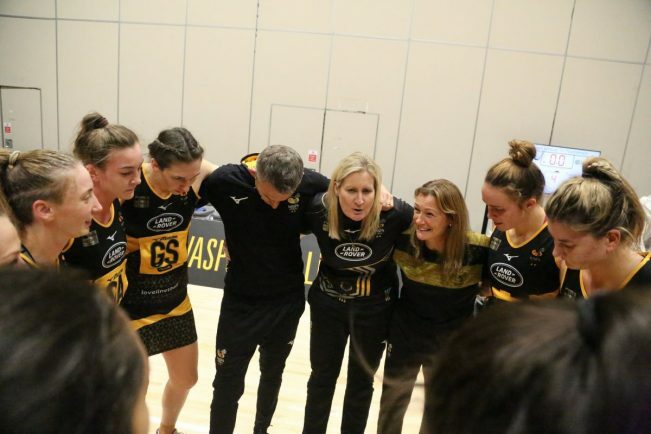 Wasps head coach Mel Mansfield has spoken at length about the task that awaits her side against the Mavericks, acknowledging the need for maximum effort despite their perfect start. “The players are feeling really good after the win against (Surrey) Storm, our error count was right down and we showed great character to come away winners in that fixture. Mansfield also appreciates the wealth of international talent in Saracens’ ranks, and has been preparing for ways to stunt their star players. “Mavericks have got four England players and have one of the strongest squads in the league,” she said. Tickets for Monday’s nights game are available at www.waspsnetball.co.uk/tickets, centre-pass taking place at 7pm.